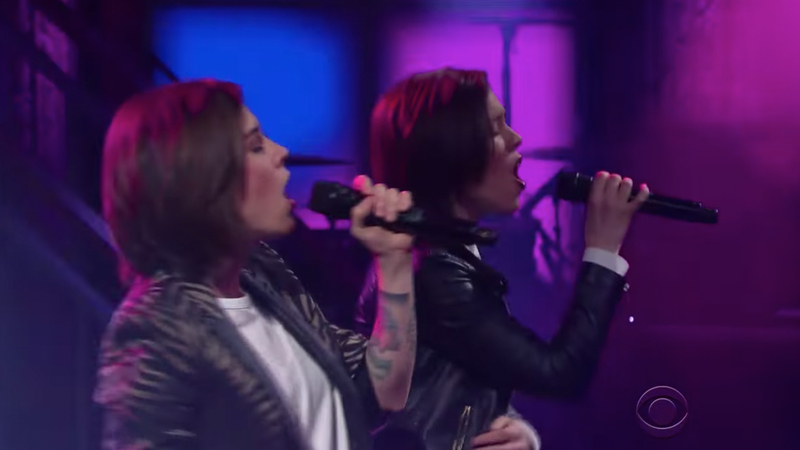 Canadian-natives and identical twins Tegan and Sara are back at it again. Currently in the middle of a world tour, the siblings have been out on the road, promoting and playing songs from their June 2016 release Love You to Death. This month, however, has been especially exciting for the “Boyfriend” singers, who've released a flirty new music video for "Stop Desire", recorded a Simlish version of the single for the upcoming Sims game, and announced 2017 dates for their European tour. In the midst of their jam-packed schedule, the duo stopped by The Late Show With Stephen Colbert to deliver an energetic performance of “Stop Desire”. Check it out below and don’t forget to track Tegan and Sara on Bandsintown so you can catch them on tour now!